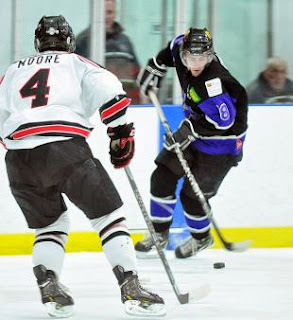 Jordan Moore in MHL action from last season. Chalk up another recruit for the St. Thomas Tommies and new coach Pat Powers. Kody Orr, who captained the Amherst Ramblers of the MHL this past season, will be taking Journalism at STU this fall. Kody is more of a defensive specialist than offensive catalyst but he did have a career best 62 points this past season with Amherst. "Known more for his defensive play and penalty killing, Orr was honoured this year with the league’s character award, while he was named the Ramblers’ most valuable player, was the top scorer and shared the players’ choice award with longtime teammate and friend Mitch O’Neill." As you can tell from the above quote St. Thomas is getting another player with heart and desire to turn things around. Orr's former coach Jim Bottomley said in a recent interview, "He gives nothing less than everything he has in every game, practice and whatever he does. His ‘team first’ attitude and hard nose style of play has been driving players on other teams crazy for five years.” Kody will join last years' MHL Character Award winner Jordan Thomas in the Tommies line up. Welcome to St. Thomas Kody.